Brian Stevens (also know as Brain, pictured right) was, at one point, a semi-pro sumo wrestler. After a life-threatening toe sprain, Brian retired his loincloth, and founded Crazy Cakes Inc. with his wife Jennifer. He is as well known for the detailed textures and realistic painting on his cakes as he is for the wild amusement experienced by their recipients. Brian is an artist at heart who strives toward one primary principle: to be as creative as humanly possible. Before cake found him, his skills already ran the gamut from digital illustration through to sculpting, including a career in video game development. Currently, Brian's focus is on breaking the rules to create new techniques to further the art of cake decorating. 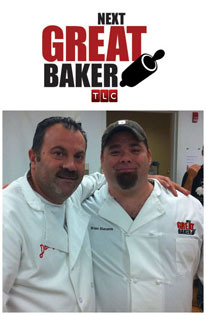 Brian's talents and hard work landed him a casting spot on season 1 of TLC's Cake Boss: Next Great Baker. After losing 30 lbs, getting 2nd degree burns, and being knocked unconscious on the show, he pushed himself into a strong finish. He may not have won, but he played honestly and kept a smile on his face which gained him much respect in the cake community. He might have gotten more air time, if he had kept his chef coat cleaner. Following a traumatizing childhood incident in which she made 7-minute frosting using salt instead of sugar on an anniversary cake for her parents, Kyla Myers recovered and vowed to do better, even though the gift's recipients consumed the confection with smiles on their faces; after carefully removing the frosting. After living abroad in more European countries than some people have fingers, Kyla launched and ran her own cake business in England for 5 years while also holding down a full-time job with British Telecom before returning to the US. Following a career in IT for several years upon her return, she was eventually bitten by the sugar arts bug again and began getting back in to the cake world, subsequently becoming President of the Capital Confectioners Sugar Arts Club in Austin, Texas. "I don't always eat chocolate... but when I do, I prefer White Chocolate!" As co-founder of Crazy Cakes, Inc., Jennifer is the glue that bonds these nuts together, a feat which requires no shortage of brains, grace, and fortitude. Part owner, baker, Mom, and bride to a mad man, Jennifer is known for her bewitching experiments in flavor alchemy. She spends many hours testing and re-testing to arrive at the perfect flavor, moistness, and structure for sculpting Crazy Cakes. 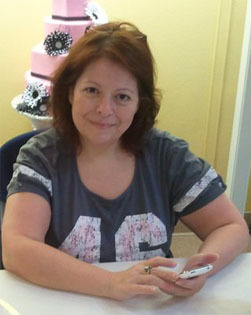 After years as a massage therapist, Jennifer has acquired the necessary skills to hand-judge the proper texture and spring of the lucious creations at Crazy Cakes. These treats won't relieve that tension in your shoulders, but after a couple bites, you won't notice anyway! When placing an order, chances are you will be working with Jennifer, as she handles all incoming orders as well as our day to day administration needs. "With all these balls in the air, my next career ought to be juggling!"